Ramgopal Dasa has more than 500 ‘Sattvik’ recipes to his credit and he has hundreds of followers on his social media account. 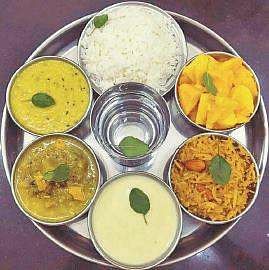 HUBBALLI: When he was a kid, he would pester his mother and granny for different varieties of food. Coming from a Brahmin family residing in Chennai, he was never allowed to eat outside. One day, his grandmother told him that if he needed variety, then he should try his hand at cooking, and the young boy obliged. Thus begun the culinary journey of Ramgopal Dasa (41), chef and recipe developer at Akshay Patra kitchen in Hubballi run by the Iskcon (International Society for Krishna Consciousness) ten years ago. His first teacher was his grandmother who taught him the basics of cooking. And today he has developed several mouth-watering recipes which are in great demand. Ramgopal Dasa has more than 500 ‘Sattvik’ recipes to his credit and he has hundreds of followers on his social media account. Sattvik food is vegetarian and excludes garlic and onion. In the temple where he resides in Hubballi, food is offered as Naivedya (offering to the God) five times a day. On special occasions such as festivals, the dishes offered to God will be more in number. For instance, about 108 dishes were prepared during the Krishna Janmashtami celebrations. Going beyond the traditional way of offering Naivedya to Gods, Ramgopal Dasa has been mixing the various ingredients to create new dishes. In other words, his recipes have a whiff of continental food, Mexican dishes and Moghul-style pulav, but are vegetarian. “I never repeat what I cook and offer to God,” he says. “Hence I ensure I make little changes and make the offerings interesting. This also helps me ensure better taste and nutrition in the food given to schoolchildren. Last month I made offerings of special Moghul pulav and later the same recipe was used in food cooked for the schoolchildren. In fact, we got a positive feedback from several schools and students about the newly made pulav,” he adds. 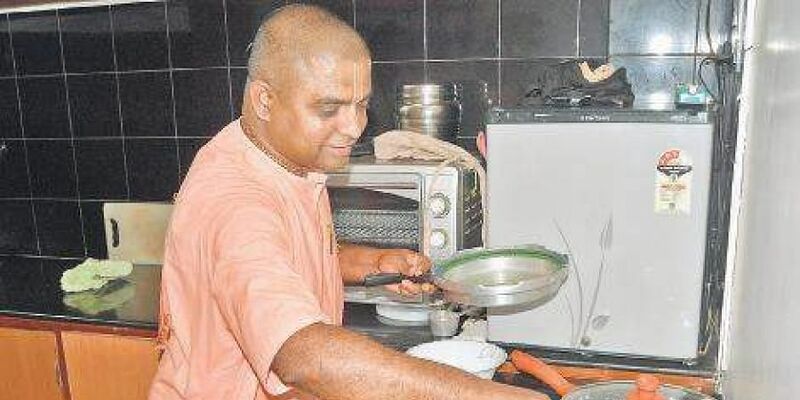 At Iskcon Hubballi, Ramgopal Dasa has his own kitchen and a small number of staffers who help him prepare the dishes for offerings. The dish-making is videographed and uploaded on the YouTube account of Iskcon Hubballi once the offerings are prepared. “Holy scripts tell us the importance of consuming Sattvik food or pure food. It’s said in Chandogya Upanishad, purified food keeps the memory tissues purified, thus giving a longer memory capacity to the person. Lord Krishna, in chapter 17 of the Bhagavad Gita says a man has to eat food for living and he must consume the pure food for the purpose,” he explains. Every year, Iskcon Hubballi organises Sattvik Food Mela, where people can taste several varieties of food. “The food at the exhibition will be cooked entirely without using onions and garlic. But the taste is improved in such a way that visitors are surprised. Many are sceptical about the taste of Sattvik food, but several recipes are now available where it has been proved that Sattvik food is not only food for our health, but also for the taste buds,” he says. Ramgopal Dasa has several followers on the social media where he has been advocating using Sattvik food in daily life. His recipes are sought after and followers get back with the dish they made.